The Arizona Oil & Gas Conservation Commission meeting in Phoenix scheduled for Feb. 7 was cancelled due to schedule conflicts with some of the members. Steve Rauzi, the Oil & Gas Administrator at AZGS was going to present a summary of activity for 2013. Forty seven drilling permits were issued and 30 wells drilled in 2013. Twenty seven wells were drilled east of Holbrook for potash. Passport Potash drilled six wells on its lands west of Petrified Forest National Park. [Right, potash core hole drilling. Credit, Passport Potash] HNZ Potash drilled the Mine Shaft Core Well #1 at its potash project area south of the park, coring through rocks overlying the salt beds to obtain information relevant to eventual construction of a shaft for underground mining. 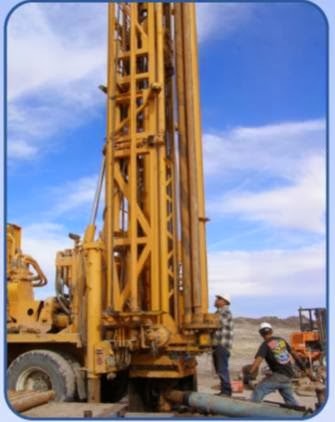 American West Potash drilled 20 wells at its project area east of the park, coring two of its holes from the surface to total depth to obtain information relative to eventual construction of a mining shaft. The Oil and Gas Conservation Commission requires a permit for the potash stratigraphic test wells because the holes penetrate the Coconino Sandstone, a potential helium reservoir in the region. Kinder Morgan tested several existing wells and drilled three new wells in the St. Johns Gas Unit in 2013. Kinder Morgan plans to develop the field as a major supplier of CO2 for enhanced oil recovery (EOR) projects in New Mexico. The company anticipates drilling up to 250 wells, building a pipeline and ultimately delivering 450 - 500 million cubic feet of gas per day to the Permian Basin oil fields by 2016, although the pipeline permits filed with BLM indicate a indicate a 16-inch diameter pipeline capable of carrying 200 million cubic feet per day.